High Quality video capture of any event is available through Digital Euphoria. All video capture contracts include DVD copy of event and web ready versions as well. VHS copies can be ordered. High Quality digital capture of any event is available through Digital Euphoria. All digital capture contracts include CD copies of all images as well as DVD slide show of images. Our DVD navigation menues offer full function graphics and live motion chapter images. Complete with chapter select, special features, interviews or what ever you wish to include, we can do it at a price that wont kill your budget. Video is the relm that captures everyones attention, it records into history, memories and events that will never happen again. This is the backbone that we use to ensure top quality digital reproduction of your events, shows, weddings, graduations... you name it we can lock it in time. All packaged in a professional box set with matching DVD covers. 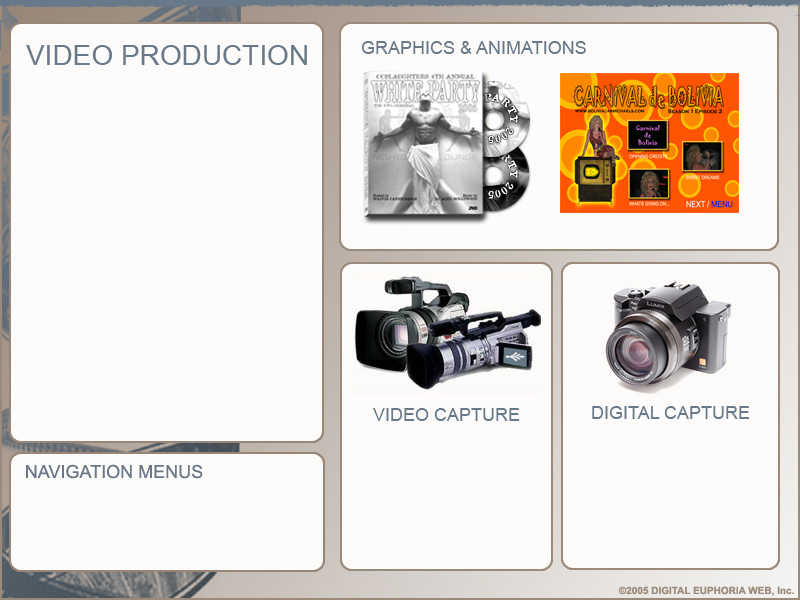 Our navigation menus are not templates from a program, each one is custom designed and built as to your DVD recordings. Digital captures receive the same top quality design and presentations. Built to run on continuous play, theres no need to always hit play when running them at your club or event. All DVD digital slide shows can be built with or without your favorite music as background audio. This is the same with DVD video, all menus in the navigation can have your favorite song, or theme song that applies to the actual video. Nothing is cut short on our video productions, and all still within your budget. VHS TO DVD transfers with menus also available.